For those of you who noticed I changed the title of these camper trailer posts, I did so because of getting a bit of odd messages, which may be connected to the use of the word widow. That’s a whole ‘nother subject. A woman on a Facebook group recently posed the question: Can a small statured woman handle the camper by herself? This is a question I had at the beginning, too. I am a small woman. The fact does give one pause, at least today it does. For most of my life until now, I never gave it a thought. I just jumped in and did whatever I wanted to do. There were people who laughed at me when they saw me at the wheel of a big one-ton dually Ford. It appeared, I guess, that I could hardly see over the steering wheel. I did sit on a pillow. And today I know some of the physical activity I did that I had no business doing. Once I almost got trampled by a horse when I came home in the middle of the night and went to unload alone. Not a safe idea. Although these things are good memories of how much I have done in my life. I am currently on my second-ever camping trip. After I arrived I spoke to Son on the phone. I thought of the procedure and how sweat had poured from me, and how many times I had had to raise and lower the tongue jack, because I had made an error, and then went over and over things to make sure I had not forgotten anything. When I decided to get a camper, I never gave the hitch a thought. Here is an example of ignorance being bliss. I pretty well figured I had towed horse trailers before, I would be able to tow a camper. I did not consider how back in those days I had a husband who had chosen the hitches and was there in case I had any problem. I had not seen the new-fangled, elaborate, supposed-to-be-safer, hitches of today. Had I, I might have decided it all beyond me. The good news is that I, a small-statured, woman of a certain age, am doing it. And yes, I do it on my own. I hope it gets easier. If not, I can change to something different. 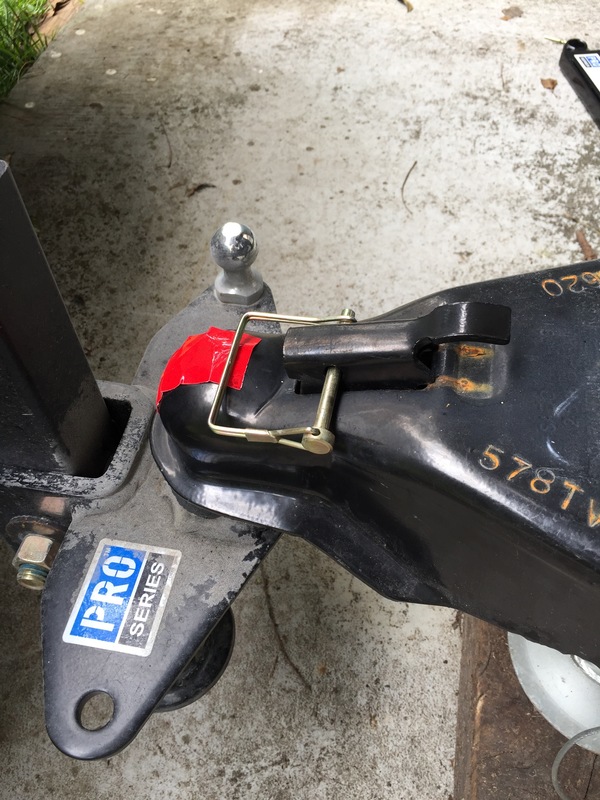 I was so happy to easily back my truck ball right up underneath the hitch. I was given the wonderful tip to put reflective tape on the hitch in order to see it better in the rear-view camera. Worked wonderfully! 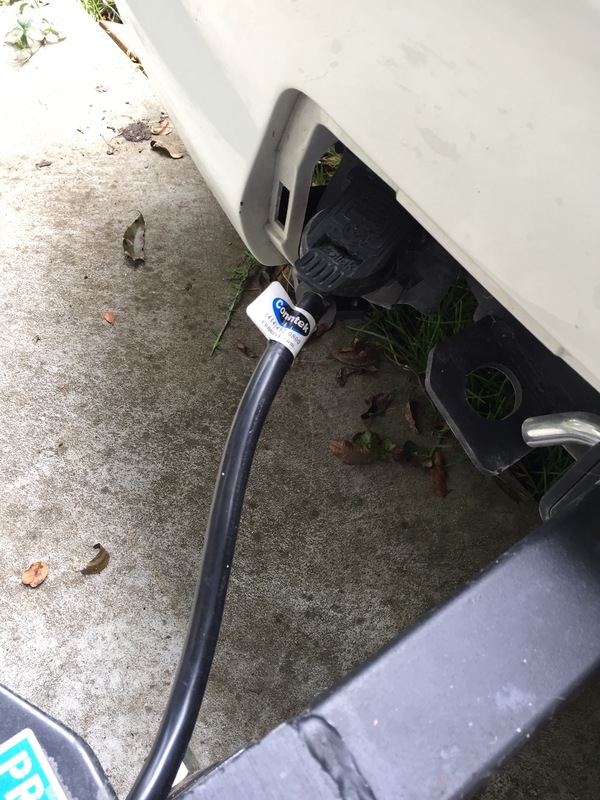 Then plug in the electric connection. Easiest thing! Anyone can do it. The most difficult part of the process for me are the weight distribution bars, which attach on each side. They are heavy. 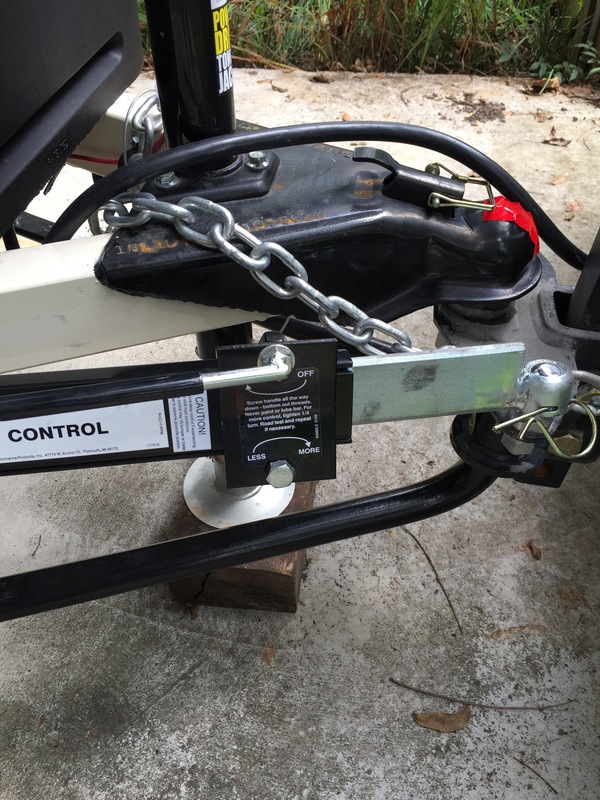 I have learned a few handy tricks that have made attaching them easier, but I still struggle. One man showed me how to press them into place shoving straight up. It takes me two hands and getting myself in a solid stance. Other than that, the electric tongue jack does the work. I just raise it until the chain is easily put in place. Safety chains are easy, although when it is hot and you are sweating, and they are coated in dust, they can be stubborn. WD-40 is handy to make life easier. Lastly, is the sway bar. This is still an uncertain thing for me. How tight to make it? One person who showed me, made it rather loose. A second person tightened it. I’m experimenting with the tightness and do find it better to tighten it more than I had thought. So there is the mess all together. 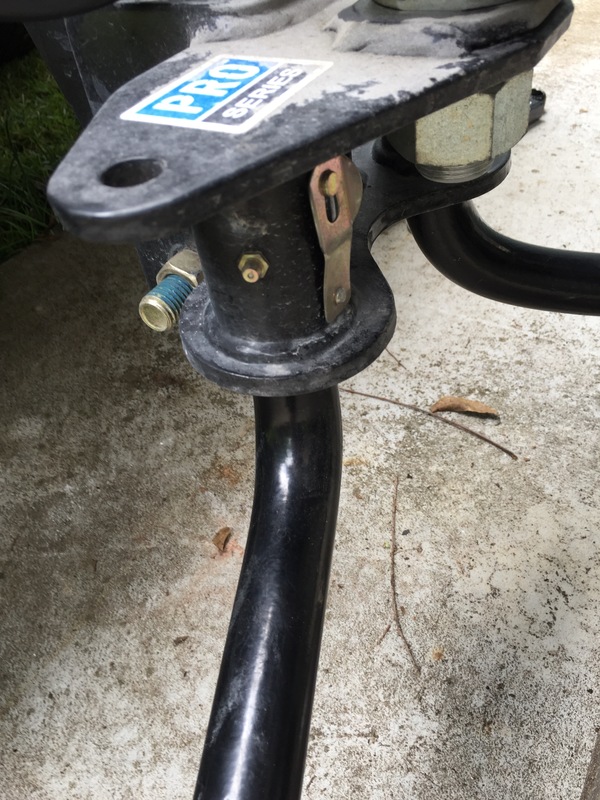 Who knew there could be so much to a hitch? It has become a challenge for me to master. As with everything, the more one does it, the easier it gets. Proud of you! Am learning to set up our popup by myself. Only thing I know I can’t do alone is installing the door. Will have to work something out for that. You inspire me! Have a safe trip! CurtissAnn, You are giving me hope that I can erect a pop up canopy by myself! Cousin you and Kevin have the same things to hook up when we are hauling our truck on the trailer. I am so impressed with you because I watch him (sometimes help) and there really is a lot to do and you have to be careful. I can’t wait to go camping with you.